An emergency kit in your car is a necessity whether you are planning to do a lot of traveling or just driving your regular routes. In case disaster strikes and the roads become inaccessible, having emergency supplies at hand can spell the difference between life and death, particularly if you’re trapped in your car. 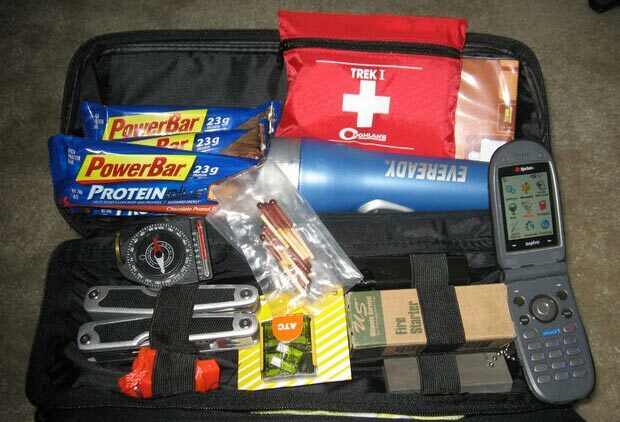 Here is a checklist of the supplies you should always keep in your car emergency kit. Food – You’re going to need energy to survive and food will give you that energy. However, you shouldn’t store just any food in your car for any extended period of time. Many foods will spoil easily, especially since it will be exposed to extremes of heat and cold. Your best choice is to buy supplies with a long shelf life, such as energy bars. At a minimum you should have three days worth of emergency food in your car. Water – Having a water supply in your car emergency kit is even more vital than having food, since just one or two days without water can cause serious dehydration and even death, particularly in hot weather conditions. You must keep at least three days worth of emergency water in your car, which is equivalent to six liters. If you’re storing regular bottled water, make sure you change it every six months. Alternatively you can buy emergency water rations that have a five-year shelf life. Emergency Blanket – It may get cold at night if you’re forced to stay in your car, so a blanket can help keep you warm. You can get special emergency blankets or sleeping bags made of reflective material that can fold to a much smaller size for storage but will reflect up to eighty percent of your radiant body heat. An emergency bivvy like this would be perfect. If you’re traveling to a particularly cold place, you can get warm packs that provide concentrated heat that you can keep in your pocket to keep you warm. Emergency Lights – If you have to get out of your car and walk to safety, you will need a light source for safety. Make sure you keep a flashlight in your car with fresh batteries at all times. Remember to change the batteries every six months to ensure the flashlight will last a long time. Alternative light sources include light sticks that can produce eight to twelve hours of continuous light or emergency candles and waterproof matches. Flares are perfect to signal that you are in need of help and can be seen from long distances in the dark. First Aid Kit – This is one of the most important things to have in your emergency kit since serious injuries can be life threatening unless they are treated quickly. The kit that you buy should have items such as pain relievers, bandages, gauze, tape, alcohol pads and soap. Other items you might want to add include safety pins, band aids and toilet paper. Emergency Tools – Your car emergency kit should have basic tools such as a multi-purpose knife, wrenches, collapsible shovel, lighter, duct tape and a map of the area you will be in. 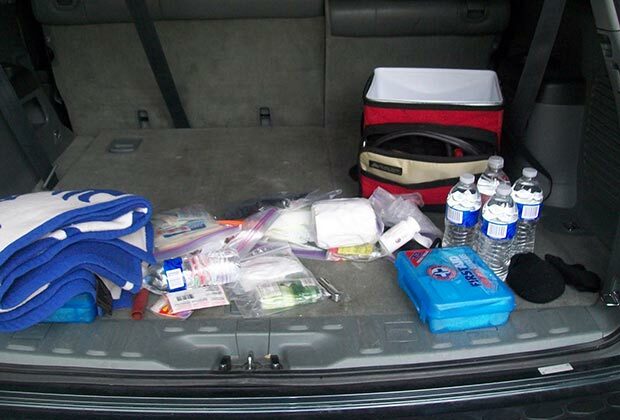 The biggest mistake many people make is only packing an emergency kit in their cars when they plan long trips. Jumper Cables – A dead battery is probably one of the most common reasons on why your car won’t start. Batteries drain easily in cold weather or when you accidentally leave your lights or radio on for to long when the car is turned off. A pair of jumper cables and another car can get you back on the road in no time. Emergencies often happen when you least expect them, so be prepared and make an emergency kit a permanent fixture in your vehicle.